Be in quick if you are interested in having a momento from the old Takapuna Library. These beautiful pohutukawa carpet tiles salvaged from the library have been cleaned and are on sale as a fundraiser for the Michael King Writers’ Centre. The striking carpet tiles were were lifted recently as part of a major refurbishment. 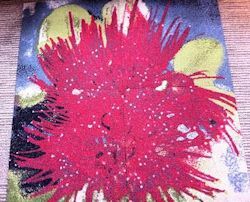 Each pohutukawa flower is made up of four carpet tiles, which together measure one square metre. We have just 30 flowers to sell at $35 each, including GST. This great fundraising idea was developed by the Devonport Friends group and the steam cleaning was done by a volunteer. While it was sad to see the pohutukawa flowers go from the Takapuna library, the refurbished library is airy, spacious and very appealing. The wonderful Angela Morton Collection, a reference collection of books and other materials covering the visual arts of New Zealand from pre-European times to the present day, has a big space in the new library and it is very hard to leave. Meantime, thanks to ongoing funding from Creative New Zealand, we will be calling for applications for our 2015 residency programme very soon. Watch this space! 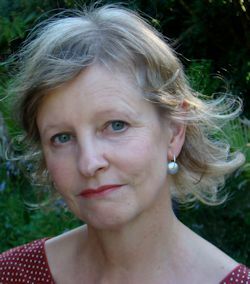 Our current writer in residence is Anne Kennedy. Anne has had success in every genre she tackles - fiction, poetry and film. Her latest volume of poetry The Darling North won its category in the 2013 NZ Post Book Awards. Her latest novel The Last Days of the National Costume is a finalist in the fiction category of this year’s awards, which will be announced in Wellington on Thursday August 27. While she holds the six-month University of Auckland residency, she is working on her next novel. Anne took part in a popular In Conversation event with Iain Sharp at the centre at the weekend. This winter’s series of In Conversation events have been a great success and the Devonport Friends group is keen to continue them next year. We have enjoyed conversations between Peter Wells and Shonagh Koea, Joanne Drayton and Linda Tyler and, last month, Gaylene Preston and Deborah Shepard. 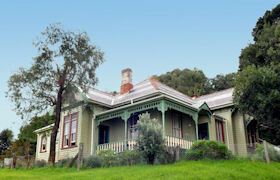 The sessions are held in the lounge of the Michael King Writers’ Centre, usually the last Sunday of each month. 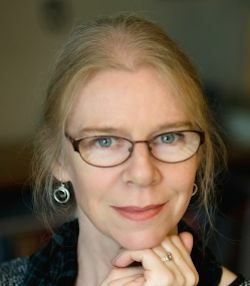 Deborah Shepard ran a series of master classes on memoir earlier in the year and will launch a new series of writing classes in memoir in September. The new series will run for six weeks and is an introduction to writing memoir, pitched at people who are new to writing or perhaps less confident about their ability. Meantime the centre has been continuing its outreach programmes for young writers. Our wonderful creative writing tutors, Ros Ali and Jo Emeney, have been running the Young Writers Programme for Year 11 to 13 Auckland students nominated by their schools, with a great offering of workshops and master classes. 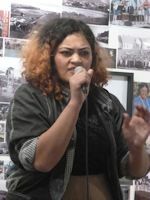 Two workshops focused on the media, with Simon Wilson, Vaughn Davis, Steve Braunias and Ted Dawe; one was on lyrics with Annie Crummer and Mike Chunn; there have been two master classes featuring Anne Kennedy and Paula Morris. There is one more master class to come, with Charlotte Grimshaw. Of course, at the end of the year we look forward to the publication of the third issue of Signals, featuring the work of the young writers. The Young Writers Programme is available thanks to a grant from Creative New Zealand. We have also been running The Poetry Project again for primary and intermediate students, with 20 workshops in schools including Birkdale Primary, Birkenhead Primary, Birkenhead Intermediate, Kelston Intermediate, Glenbrae School and several at the Southern Cross campus. This year the programme was funded by a grant from the Auckland Council. Grace Taylor and Daren Kamali are the poets who have been involved in the sessions this year, and they have been a huge hit with the students. Daren has since been chosen for the prestigious Iowa Residency. Follow us on Facebook to see the wonderful photos from these workshops. 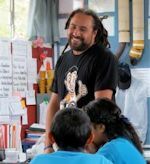 Ros and Jo’s great work with the young writers has been recognised by the Auckland Council, which asked them to lead a new workshop series for young immigrant writers, New Kiwi Voices, with its own special publication. 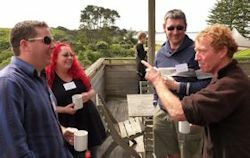 Lynn Dawson, the chair of the Devonport Friends group, has also been taking Real Writing workshops for new writers in the community, with the support of local boards on the North Shore. Congratulations to Wellington-based writer Tracy Farr, whose first novel, The Lives and Loves of Lena Gaunt, has had tremendous success in Australia. Earlier this year it was long-listed for the prestigious Miles Franklin Award and now it is on the short list for the Western Australian Premier’s Book Awards, alongside works by leading Australian writers Alex Miller, Richard Flanagan and Tim Winton. Tracy worked on the manuscript of her book as a visiting writer at the Michael King Writers’ Centre way back in 2009, so we are thrilled at her success. As well as our In Conversation series, we have had a host of interesting events. Matariki was a big time for us, with a moving powhiri for Kelly Ana Morey, who held the Maori Writer’s Residency this year. 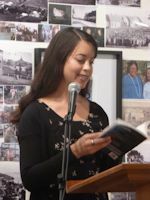 Kelly, who is working on a novel about the race horse Phar Lap, also took part in a brilliant Matariki poetry event with former resident writers Ben Brown and Te Awhina Arahanga, together with Apirana Taylor, Robert Sullivan, Kiri Piahana-Wong and Amber Esau. It was a great thrill to have all of these wonderful writers together at the Depot Artspace in Devonport. Look out for our forthcoming events during the Auckland Heritage Festival and the Devonport Arts Festival. The Storylines Festival is on right now. Family days, workshops and events started in the weekend and are on around the country for the next couple of weeks. Word, the Christchurch Writers’ Festival starts this week. The great Going West Festival is coming up in September. Applications for the International Travel Fund, administered by the New Zealand Book Council, in partnership with Creative New Zealand, close on Friday 29 August. Applications for the Todd New Writers Bursary close on September 5. Applications for the NZSA/ Auckland Museum Research Grants close on October 6. The Caselberg International Poetry Prize opens in September and closes on October 31.
who make this project possible.